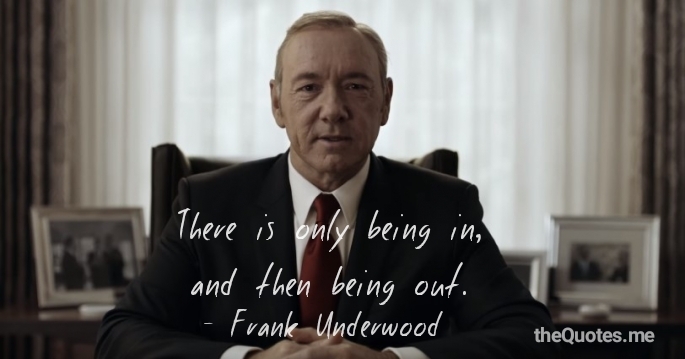 There is only being in and then being out. 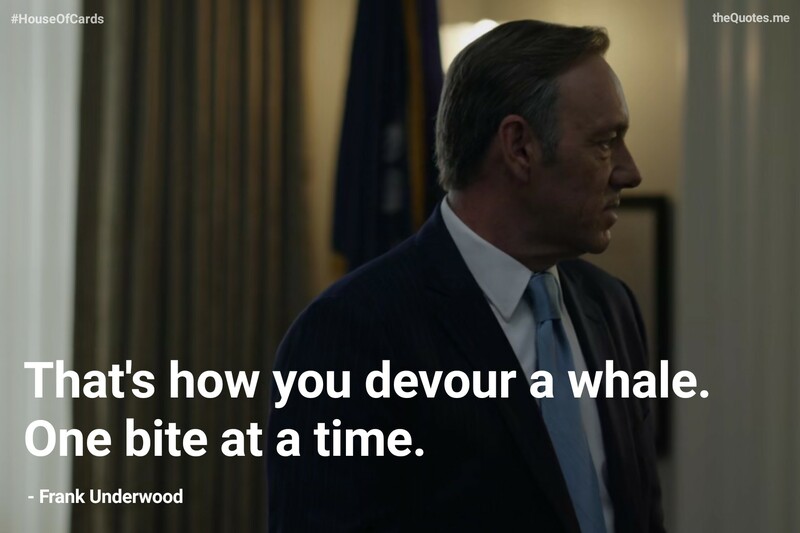 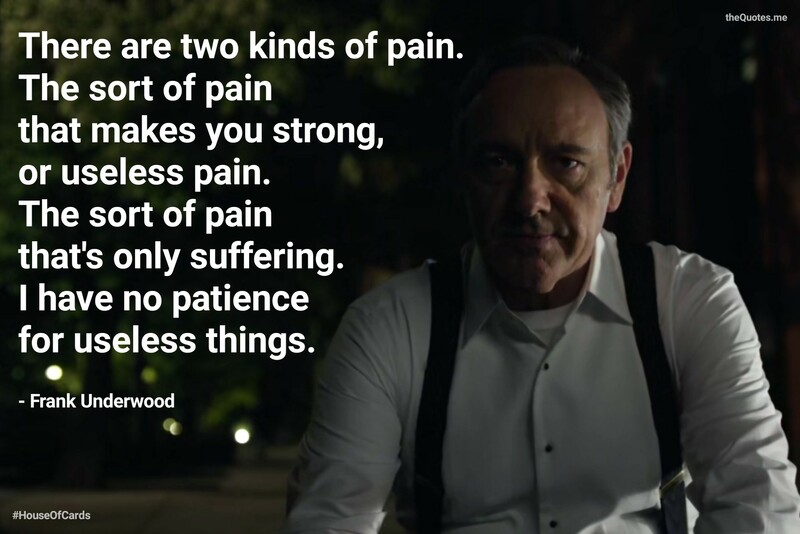 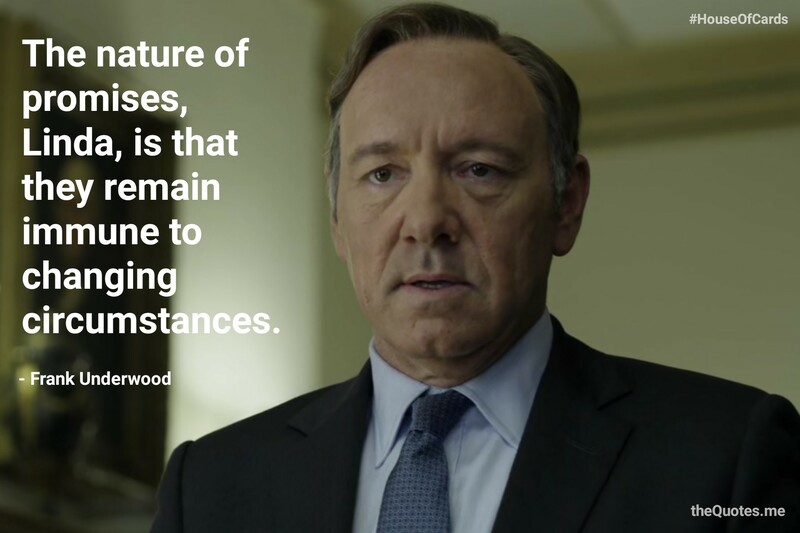 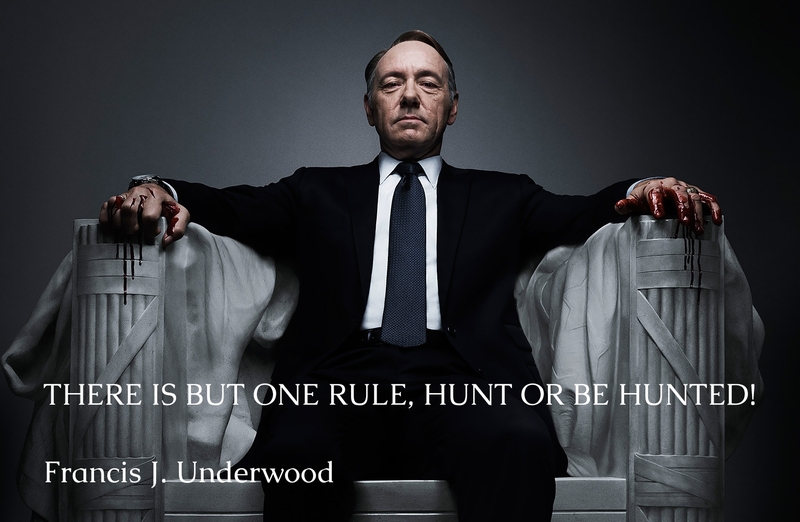 Author theQuotes.mePosted on August 5, 2017 October 26, 2017 Categories Frank Underwood, House Of Cards, TV ShowsTags american president, based-on-british-tv-series, bordeaux wine, breaking the fourth wall, breaking the fourth wall by talking to the audience, cleaning-up-after-a-party, corruption, direct address, duplicity, Episode 12, Fictional Character, fourth estate, Francis J. Underwood, Frank Underwood, government-corruption, House Of Cards, husband-wife-relationship, journalism, journalist, Kevin Spacy, killing a dog, Life Lessons, machiavellianism, manipulation, mass-media, media-manipulation, new-media, new-year's-eve-party, passed-over-for-a-job, playing-a-video-game, political-corruption, political-power, politician, Politics, Power, President, remake, remake-of-british-series, Season 5, silver-cigarette-box, stopped-by-police, strategy, tuxedo, TV Character, TV Show, u.s.-capitol-building, u.s.-congress, u.s.-president, u.s.-vice-president, vice-president, washington d.c., White House, winslow homer paintingLeave a comment on There is only being in and then being out. 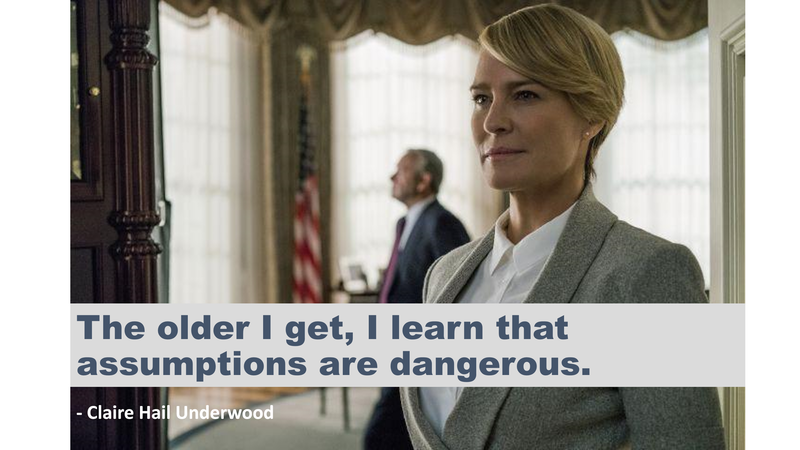 The older I get, I learn that assumptions are dangerous. 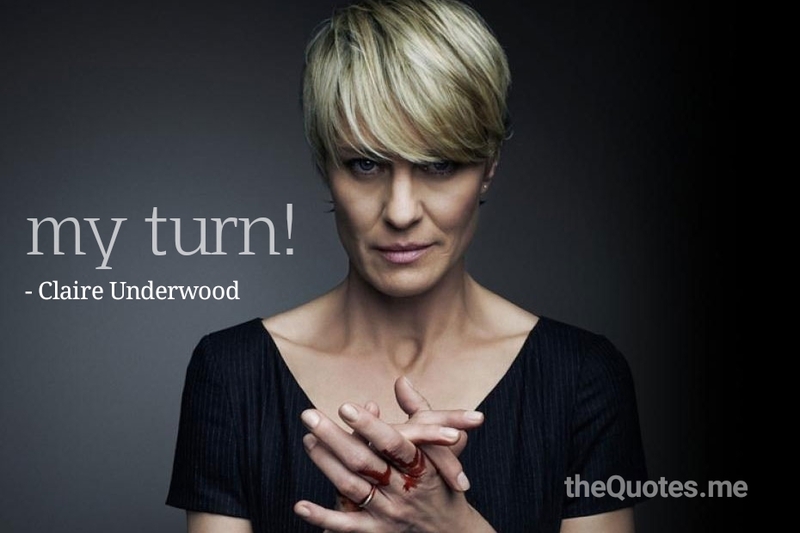 Author theQuotes.mePosted on July 31, 2017 February 2, 2018 Categories Claire Underwood, House Of Cards, TV ShowsTags american president, based-on-british-tv-series, bordeaux wine, breaking the fourth wall, breaking the fourth wall by talking to the audience, Chapter 65, Claire Underwood, cleaning-up-after-a-party, corruption, direct address, duplicity, Fictional Character, fourth estate, government-corruption, House Of Cards, husband-wife-relationship, journalism, journalist, killing a dog, machiavellianism, manipulation, mass-media, media-manipulation, Memorable Quotes, new-media, new-year's-eve-party, passed-over-for-a-job, playing-a-video-game, political-corruption, political-power, politician, Politics, Power, President, remake, remake-of-british-series, Robin Wright, Season 5, Short Quote, silver-cigarette-box, stopped-by-police, strategy, tuxedo, TV Character, TV Show, u.s.-capitol-building, u.s.-congress, u.s.-president, u.s.-vice-president, vice-president, washington d.c., White House, winslow homer paintingLeave a comment on My Turn!